Is It Needed for People Who Knows AI? Is It Needed for People Who already took the Deep Learning Specialization by Prof. Andrew Ng? As we can see, at the first section, it talks about what AI and machine learning (ML) are in a very general way that everyone can understand. In this section, it talks about if we need to apply AI, ML or data science, what things should we do to apply them into our works? And how we can apply AI and cooperate with the other teams so that the company can reduce cost or make more profit. In this section, there are some simple use cases to illustrate as well. In this section, it mentions in more details about how to build AI in the company. More detailed use cases are described as well. What things we should avoid when launching an AI project. What things we should do when we want to start a project within a company. At last, it also mentions the ethics and bias of AI. How we can reduce the bias of AI, etc. And how AI affects our jobs, society and economies in the future. 2. Is It Really for Everyone? Yes, it is for everyone especially for those who do not know about AI before. There are no maths involved. Everyone can easily understand the materials. For those who are running a business, or some management level persons such as directors and managers, it is worth to read about it to see any chance they can apply AI to transform the business. Also, understanding the strength and weakness of AI is important. If there is existing AI team, understanding some concepts of AI can definitely help to communicate with AI team. Because knowing AI, we can know what AI can do or cannot do. This is also useful for every employees who needs to work with AI team. 3. Is It Needed for People Who Knows AI? For this question, I think it is not needed for those who knows AI well and knows business well. Say for example, if you are already working in an AI team, and working with other non-AI teams well, I think it is not needed to take this course. For my case, I only knows some of machine learning or deep learning especially in the field of computer vision. I am the mentor of the 4th course (CNN) in Deep Learning Specialization (A series of courses about deep learning taught by Prof. Andrew Ng as well.). To me, I learned a lot in this course as well. I learned what needs to do so that AI and business team can interact each other. And I also learned the job positions within AI team. At least, it is useful when I need to seek jobs outside university. 4. 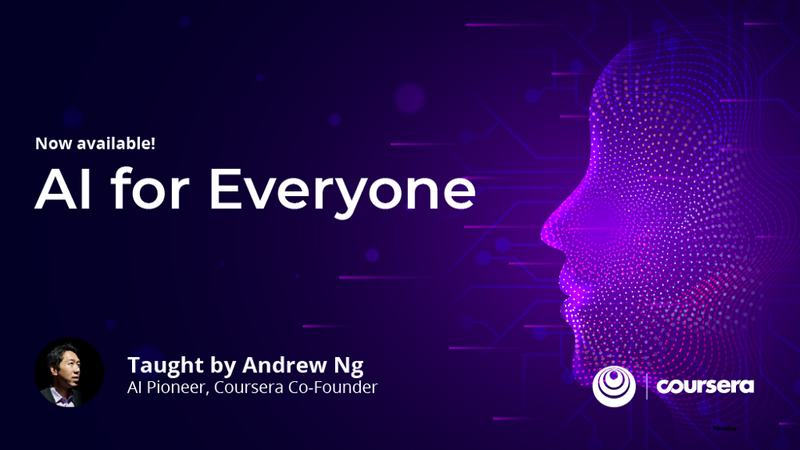 Is It Needed for People Who already took the Deep Learning Specialization by Prof. Andrew Ng? Again, it is not needed for those who knows AI well and knows business well. Say for example, if you are already working in an AI team, and working with other non-AI teams well, I think it is not needed to take this course. But if you have only taken the Deep Learning Specialization, it is also worth to take this course. As mentioned, it talks about more how AI interacts inside the company and interacts with business team, which are NOT included in the deep learning specialization. If you do not know AI and want to have an AI job, I suggest to takes both “Deep Learning Specialization” and “AI for Everyone”. After taking both, it is only the first step going into the field of AI. It is more likely to have more studying on AI. If you just want to study the core of deep learning, it’s better to take Deep Learning Specialization to learn the technical stuffs. Of course, I can only share what I’ve learnt in the course. Maybe it is not the case for you. But I hope this story can provide some helps.